"I have thought it might be possible to make a stab at understanding Auschwitz by trying to understand Sophie, who to say the least was a cluster of contradictions." "No one will ever understand Auschwitz." Not just himself, NO ONE will ever understand Auschwitz. Such is the magnitude of the lessons Stingo learns from what happened during that fateful summer in 1947. Appearances are deceiving, and the more you learn about the people you thought you loved and trusted, the less you really understand them. It's a cynic's view to be sure, but one can hardly blame Stingo for cynicism given the story he tells us. Stingo, a 22-year-old Southerner-transplanted-to-New-York, has just been fired from a soulless editing job at McGraw Hill, and has moved to Brooklyn to write his great Southern novel. There, in the same boarding house, he meets Sophie, a 29-year-old Polish refugee, and Aucshwitz survivor (even though she's not Jewish — she was rounded up and taken to the concentration camp in 1943 for stealing a ham to feed her malnourished kids). Sophie's beau is the brilliant, eccentric Nathan. The three become fast friends — and Stingo begins to harbor a forbidden love for Sophie. As Nathan becomes more eccentric, and Sophie reveals more and more details about her past life, as well as the last year of her life with Nathan in New York, Stingo struggles to make sense of it all. The cold, black-and-white logic of psychology competes with both his feelings for Sophie and also his (and anyone's) inability to understand what the lasting effects of Auschwitz have been upon her. Codependency? Alcoholism? Masochism? All of those are just words, and all fail spectacularly to capture what is really happening inside Sophie's head. This is, quite frankly, the saddest novel I've ever read — and one of the most intense. It's a story that doesn't exactly move along at the speed of light (Styron, the quintessential mid-century New York intellectual, writes rather densely), but it's absolutely fascinating nonetheless. Many people are probably more familiar with this story from its early-80s film, and Meryl Streep's Oscar-wining role as Sophie. I wasn't. At all. So I'm still blown away at, first and foremost, the story itself, and secondly, how carefully each section of story is revealed — and how what you learn about the characters shapes how you view past events. I loved it, but I won't recommend it for probably 90 percent of readers. If you try it, spend some time gearing yourself up first. I remember reading SC and seeing the movie(a great Meryl Streep performance there)and yeah,it's sad but beautiful in the way Stingo tries to capture a true portrait of these two people newly arrived in his life and at best,can only grab a few glimpses. Gloria Steinem wrote about Stryon's work in one of her essay collections(she's not a fan)and insisted that the title choice was based on sexism. Sorry,but I wasn't buying it then and still won't today. Won't get into too many details,since some folks haven't read the book or seen the film,but Steinem was totally clueless on that score,in my opinion. It is certainly a beautiful - and true, inasmuch as it can be - portrait of two rather volatile lives. I don't understand at all why the choice of title would be sexist - maybe if it was "The Choice Dictated To Sophie That She Had No Control Over, Much Like Her Life," then I could see that argument. But it's not. Thanks for your review - I have had this sitting on my bookshelf for several years. Having never seen the movie either, I liked reading your comments and will eventually have a go at it one of these days! I was the same as you - in fact my copy is one I got at a yard sale in the mid-90s, I think. Give it a shot - it's a rewarding reading experience! 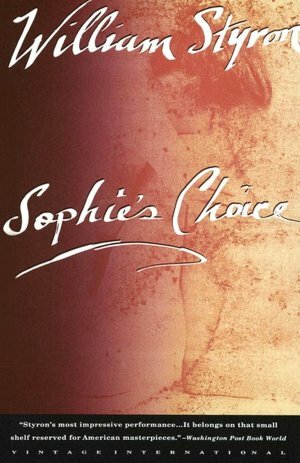 Sophie's Choice was the first book that revealed to me what a truly horrible place Poland was during World War II. The Polish were vicious and brutal to the Jews, even those who had been friends and neighbors for many generations. However, the Germans hated all Poles and victimized many who were not Jews. This was the first book I read that portrayed the lives of non-Jews in a concentration camp and their lives as survivors. I recently read Displaced Persons by Ghita Schwartz, which is also about Polish Holocaust survivors who emigrate to New York, and I found myself thinking about Sophie. Her story is believable and tragic. Styron has been a controversial writer for a long time. After reading Sophie's Choice, I also read The Confessions of Nat Turner, another book that elicits strongly-held mixed reactions. I found it extremely thought-provoking and urged my friends to read it so we could talk about it. That's an excellent point about the depiction of the Germans' attitude to the Poles and the Poles' sometimes attitude toward the Jews - that's all sort of a footnote in history; something I knew nothing about, and which is fascinating. Thanks for the recommendation on Displaced Persons, too - looking into that now. And I'd also been tempted to look into Nat Tuner - just because Stingo (Styron) becomes so fascinated with him in the novel, too. This is one of those books I've heard about but never actually read! This has gone on long enough - it's on my list! Thanks for the review! 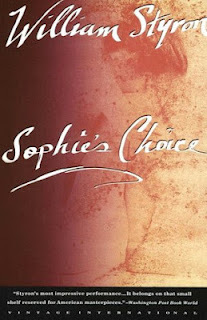 That was the same for me - I was embarrassed that I didn't know what Sophie's choice actually was, but everyone else seemed to. Glad I looked into it - good luck with your own read! I've only ever seen the movie and it is probably the saddest movie I have ever seen and since books stay with you so much longer I can only imagine how intense this read must have been. Fascinating review. ...an excellent point - it is definitely a novel that will stay with me. I'm not even sure I want to see the movie now, despite its Academy Awards, etc. - just to keep my impressions of it as my own. I can't bring myself to read this novel. I have three kids and, though I'd like to temporarily dump them sometimes, cannot stand the thought of this story. Call me wimpy! I can take it. I really adored this book. It's quite possibly one of the best books I've ever read. I read it at the beach, which was very odd an I don't recommend, but I could only read a book this depressing in bright sunshine, otherwise it might have just crushed me. I need some time before I decide where it fits in the grand scheme of "best books" and what not - but it's been a week since I finished now, and I can't get it out my head. That's a sign, right? Joining you from over at Kate's Library who linked to this post. One of those books that everyone tells me I must read, after your review I think I shall have to pick up a copy ...... along with a box of tissues. Nice to meet you, I've enjoyed my visit. Thanks for stopping by! Yeah, the book should just come with tissues. It's ridiculously sad. I think I read this 20 years ago, and it has stayed with me ever since. I think back often to "the choice" itself - how awful. What a sad, sad book (and what a beautiful writer). It might proved to be some sort of great idea to follow above mentioned techniques and tips to show deliberately good results for the future purpose. That is a bold claim. Is it still the saddest thing you have read? I only read Brian's publications. Do You Read Long Series Before They're Finished? The Family Fang: Performance Art is Still Art?